The 8 Hour Diet is a popular weight loss plan from David Zinczenko the author of the best-selling book Eat This Not That. With this diet, David promises readers that they can lose 20-60 pounds or more and still eat whatever they want. The key to the 8 Hour Diet is only consuming calories within an eight-hour window each day. Zinczenko himself lost 7 pounds by eating according to this method. His concept isn’t entirely new as there have been several diets over the years that promote intermittent fasting as a way to lose weight. Here’s how his version works. This diet works on the theory that the human body is designed for periods of eating and then periods of fasting. This involves consuming calories over an 8-hour period and then fasting for a 16-hour period each day. During the 16-hour period, the human body should be focused on repair and rest, rather than continually digesting food. All of a dieter’s daily calories must be consumed only during his/her predetermined 8-hour eating window. For example, if your calorie window is from 9 am to 5 pm, you must eat during that time period only. The window can be adjusted depending on a person’s schedule and can be different during different days of the week. Dieters should eat this way at least 3 days a week at the beginning of the diet and gradually increase towards the ultimate goal of 7 days a week. There are no forbidden foods on The Eight Hour Diet, but Zinczenko does advise that this diet is not an excuse to overeat. Portion size must still be considered. The only exception to this rule is sugary beverages since the 8 Hour Diet discourages drinking calories. Snacks can be eaten as often as a dieter wants as long as all eating is within the 8 Hour Diet window. Portion size should be considered when choosing snacks. The 8 Hour Diet shows dieters how choosing 8 healthier power foods instead of processed and refined foods can dramatically increase the effectiveness of the diet and the dieter’s overall good health. The book gives suggestions on how to easily incorporate these foods into the diet. Exercise suggestions for the most effective calorie burn are included in the book. 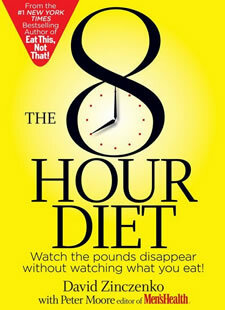 The 8 Hour Diet: Watch the Pounds Disappear Without Watching What You Eat retails for $26. It all comes down to calorie restriction. If you can find a way to keep the calories low enough to result in weight loss, you will be successful. By only having 8-hours to consume your food, you might be able to trick the body into taking in fewer calories. This diet reminds me of a couple of years ago when Oprah talked about cutting off your eating at 6 pm as a way to lose weight. This became a popular diet trend for a while because it helped to prevent late night overeating and excess calorie consumption. Intermittent fasting has shown health benefits. Another benefit is that you don’t have to deprive yourself. Many of us have been through so many diets that we feel overwhelmingly deprived. This is bad for our long term success. We need to learn how to feel comfortable making choices that aren’t so healthy, but in exercising excellent moderation and portion control. The bottom line is: The body knows calories in and calories out for the entire day. So, if you can eat balanced, keep the metabolism going strong, feel healthy, then it doesn’t matter too much when you eat. It matters how much you eat. The authors claim that the types of food don’t matter too much. However, you can’t expect to eat 1200 calories of chocolate for your diet and feel amazing. We must continue to eat a balanced portion of fruits, vegetables, lean proteins, healthy fats, and a few healthy carbohydrates. The authors do support healthy eating with the 8 Hour Diet Power Foods, but they don’t want to restrict you. It can be tough to stave off hunger in the evenings. For example, if you start eating at 8 am, then you can’t eat anything past 4 pm. What are you supposed to do if you feel hungry again at 8 pm, and don’t go to sleep until midnight? Many suggest waiting to have breakfast to help with this. But, research proves that breakfast is best for the metabolism if eaten within the first hour of waking. Not suitable for those with unstable blood sugar. The authors say that you only have to follow the diet 3 days per week. This seems odd to me. Why not follow it 6 days per week? 3 days is only about 43% of the time. This doesn’t seem too effective. This is not a new diet idea. Intermittent fasting has been around for quite a few years now but has yet to gain popularity until now. In the end, the positives and negatives seem to balance out. I have a feeling it will work for about half of the people who try it. So, try the diet if you like, and let us know how it goes for you! So I do 8/16 (I guess). I eat breakfast and lunch and skip dinner (6am-2pm). I don’t see a problem with this but everywhere I see it suggests to skip breakfast… any thoughts? I agree love my breakfast, can’t miss it so I’m with you in last meal @ 2pm, Helen. MY name is Randy. I started this diet @ 2 months ago. 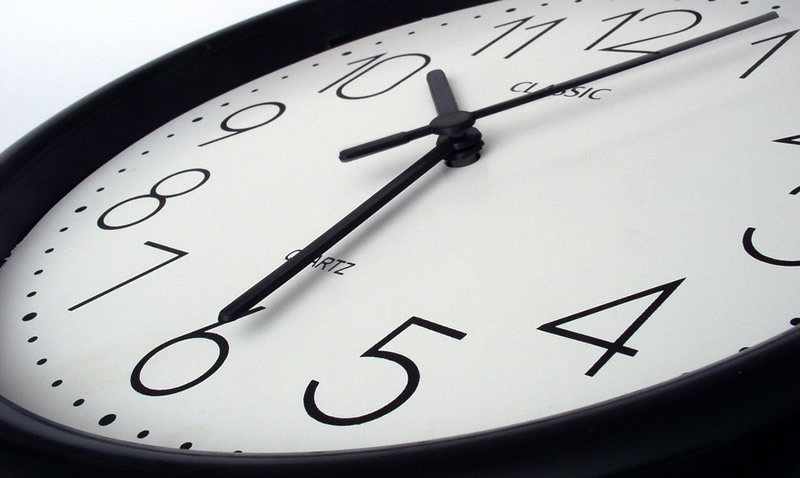 eat within a 9 hr window..usually between 12 – 9pm . I only allow myself 2000 calories Monday through Friday and on weekends i allow myself to eat whatever but still keep it within the same time period. I drink coffee with stevia sweetener (no calories) in the morning until my “eating time” is allowed. I started at 245 and am now at 212 lbs..a total loss of 33 lbs as of 8/5/18. I have not really done any major exercise but my job entails quite a bit of walking ( I do now own a treadmill and get on it maybe 2 times or more a week(depending on how tired I am hehe) THIS DIET WORKS! I was amazed at how fast I lost weight at the beginning. Now the pounds are a bit harder but still falling off slowly. I hope this helps anyone thinking of trying it. I had my doubts but now I BELIEVE….GOOD LUCK! I’ve just started the 16.8 diet my window is from 2pm to 10 pm (due to work ) I’ve done this for a week and I’ve put on 2lbs !!! *I’ve been excersising every day as well so why haven’t I lost !!!! I started this fast 3 weeks ago…So far I’ve lost 2 lbs a week…Not to mention the inches…60yrs young. . Getting lil exercise and feeling much much better!…Eat what ever I like…Just don’t pig out!…Use any time frame you like…Time wise…My window is 6pm to 10am..Like medication…For best results doing it the same time every day helps…Oh forgot to mention…I fast every day!…Set the alarm on my phone and just stick to it…Also, Just drink water if you are feeling hungry…I love water so this is easy…Try it!. ..I’ve tried It all..Couldn’t stick to anything…This is going to work for me!!!! If i work a shift from 2 PM to 11 PM, should I stick to breakfast and then an early dinner, or what would be the best recommended strategy where compromise is minimum? I have been doing this for about three weeks and have lost eight pounds. I find i sleep better than ever and food cravings have gone. It’s easy and i plan to eat this way for ever. Why not it works and i feel so well. Oh and i don’t do the exercise first thing but must aim to do this. Is it better to exercise before your eight hour window opens or during? Get your bigger meals out of the way first. It’ll help with bloating and keep you fuller for longer. Alternatively, drink a pint of water before all meals. “never confuse thirst with hunger”. After getting some negative results on my blood work, I started dieting on June 21. I am eating low-carb and counting calories (1200- 1400), but I am also eating in an 8-hour window. Based on calories intake alone, I should be losing about two pounds per week; however, I’ve already lost 14.5 pounds in 19 days. I haven’t lost weight at that rate since I was in my 20s (I’m in my 60s). I have to think the intermittent fasting is the difference. I also walk at least 30 minutes each day and drink about 80 ounces of water, but I’ve done that before and haven’t had the amazing results I’ve had since eating in an 8- hour window. Will fast work 7 am to 3pm? Everyone seems to be starting much later. Would it help to swap starting hours occasionally? I would say yes, it’s the fact that you’re not making your body work at digesting food for 16 hours, so the actual time you eat is entirely your choice. I am doing 10 to 6, but if I needed to would move the time frame. It’s the 16 hours that are important, so start at 7 am if you need to. Here’s what I did,I start eating at 10 am,and I really get full (rice,viand,coffee and dessert) after that,I stop then eat again after 8 hours (6pm) In between I just drink water.I never crave or get hungry until 6pm.My question is,can I have a light snack during 8 hour window? Or can i still take lunch? This is my 8 day of IF but I noticed that I already lost weight. These are the times, Im choosing, Yes, It does work!!! I think you have this backwards. You are supposed to eat WITHIN the 8 hours. Not outside of it. It is 16 hours of fasting then 8 hours of eating. So you should eat a good amount of food within the 8 hours so you arnt hungry after! Should the 3 days be right in a row or alternate days in between? And is there a benefit or lack thereof, just starting at 7 days right away?